After the leak on the Taiwanese Xbox Marketplace last month, it seems 505 Games and Reloaded Games are ready to announce HAWKEN's console release... sort of? The free-to-play title will be coming to the Xbox One and PlayStation 4 "late June/early July." If you're not familiar with the game, it's a FPS that puts you into the cockpit of your very own mech. Each of the 30 mechs comes with its own skills and weapons loadout allowing you and your friends to create a team that comprises a variety of different types. Though the game is largely PvP-based, there are two main co-op modes: Bot Destruction and Co-Op Team Deathmatch. The former pits four players against 25 waves of bots with a special mech encountered every fifth wave. The latter is similar to the regular Team Deathmatch mode, only you and five of your friends will take on six A.I. controlled mechs. As the game is a free-to-play title, there are a few progression/real-world money mechanics. 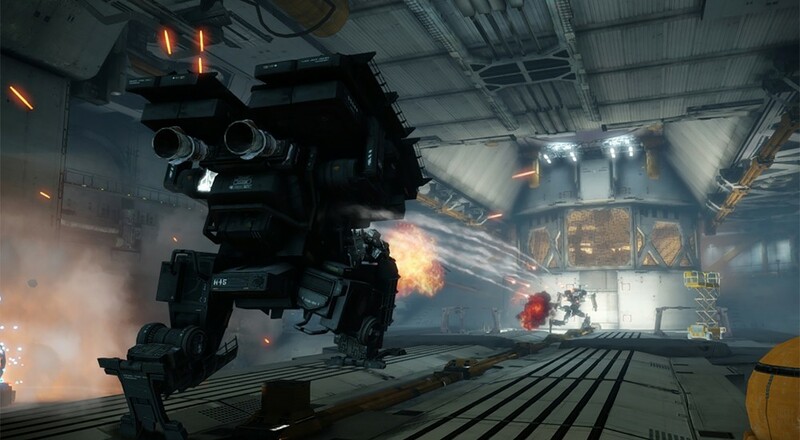 Playing a match will earn you mech and pilot XP, as well as the in-game currency, HAWKEN Credits (HC). Mech XP increases a particular mech's ranks, which opens up new customization options and mech parts for that mech. Earning pilot XP will increase your pilot rank, which opens up new items and things to buy. Most things in the game can be purchased with the earned HC, but you can buy Meteor Credits with your money to buy things as well, including boosters that increase the amount of XP and HC you earn. I'll be honest, it's a very confusing system at first so hopefully they simplify things a bit on the consoles.